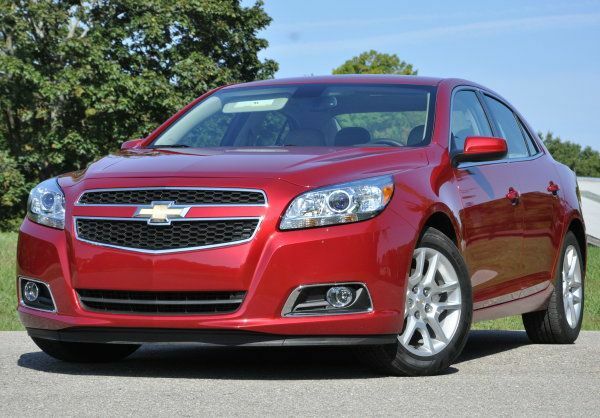 The first and most significant new GM recall pertains to select 2013 Chevrolet Malibu sedans which are equipped with the optional power front seats. In these Malibu sedans, there is a troublesome wiring harness under the seat that could rub against the metal frame of the seat. Over time, this friction between the wiring harness and the seat frame could cause the protective coating to wear away and when the exposed wire contacts the metal, it can short out and spark. That spark can be enough to set the padding of the seat cushions and the under seat carpeting on fire. In fact, General Motors has received two complaints of the 2013 Malibu catching fire but these vehicles were parked and unattended so there were no injuries. There have been no accidents stemming from this problem. In total, 14,929 examples of the Malibu sedan are included with 14,909 of those in the United States, 13 in Canada and 7 in Mexico. The second Chevrolet Malibu recall pertains to 2014 model year vehicles which have a faulty HVAC system. It seems that these Malibu sedans are equipped with a defrosting system that may not function as expected. There is no fire risk from this electrical gremlin but having the defroster not work correctly could limit visibility when driving in cold conditions and that could lead to an accident. In total, 44,406 vehicles are included in this 2014 Malibu recall with 42,696 in the US, 1,034 in Canada and 676 in Mexico. Unfortunately, these recalls have not yet appeared on the National Highway Traffic Safety Administration website so we do not have our normal explanation of the recall details but we can expect that both of these recalls will begin fairly soon. In the case of the power seat wiring recall, a technician will likely inspect the routing of the wiring harness in question and if needed, they will either re-route the harness or install some sort of protection to prevent the harness from running against the seat frame. With so few details on the HVAC problem in the 2014 Malibu, it is hard to speculate how the company might address it but depending on the nature of this problem, it could be something as simple as an adjustment in the HVAC control system or it could be as significant as replacing a wiring harness, a switch or some other component of the climate control system. In any case, these repairs will be performed to the 2013 and 2014 Chevrolet Malibu free of charge and concerned owners should contact their local dealership in reference to these recalls.